Tricking a crew-mate into looking at their shoe during a transport was a common prank in the 23rd Century. Teleporters, in one form or another, have been around in Science Fiction for a while now. Most people’s introduction was probably via one of the Star Treks (the transporter) which is amusing, as it was a cost-cutting mechanism to make it easy to get from one point in the script to another. 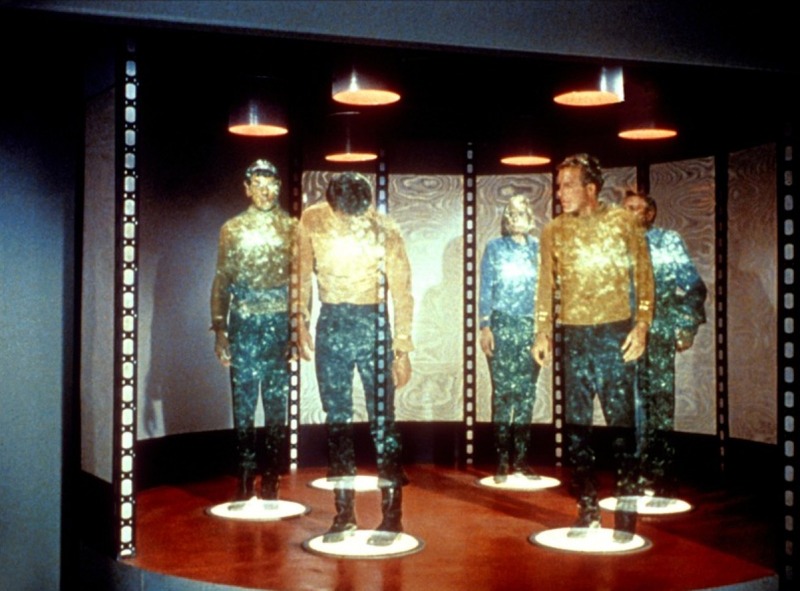 Is teleportation actually possible at the human scale? Sadly, the answer is probably not although we can do some cool stuff at the very, very small scale. (You can read about the issues in teleportation here and here, an actual USAF study.) But just because something isn’t possible doesn’t mean that we can’t get some interesting use out of it. I’m going to talk through several ways that I could use teleportation to drive discussion and understanding in a computing course but a lot of this can be used in lots of places. I’ve taken a lot of shortcuts here and used some very high level analogies – but you get the idea. The first thing to realise is that the number of atoms in the human body is huge (one octillion, 1E27, roughly, which is one million million million million million) but the amount of information stored in the human body is much, much larger than that again. If we wanted to get everything, we’re looking at transferring quattuordecillion bits (1E45), and that’s about a million million million times the number of atoms in the body. All of this, however, ignores the state of all the bacteria and associated hosted entities that live in the human body and the fact that the number of neural connections in the brain appears to be larger than we think. There are roughly 9 non-human cells associated with your body (bacteria et al) for every cell. The good news is that we probably don’t have to send all of that information because, apart from anything else, it appears that a large amount of human DNA doesn’t seem to do very much and there’s lot of repeated information. Because we also know that humans have similar chromosomes and things lie that, we can probably compress a lot of this information and send a compressed version of the information. The problem is that compression takes time and we have to compress things in the right way. Sadly, human DNA by itself doesn’t compress well as a string of “GATTACAGAGA”, for reasons I won’t go into but you can look here if you like. So we have to try and send a shortcut that means “Use this chromosome here” but then, we have to send a lot of things like “where is this thing and where should it be” so we’re still sending a lot. There are also two types of compression: lossless (where we want to keep everything) and lossy (where we lose bits and we will lose more on each regeneration). You can work out if it’s worth doing by looking at the smallest number of bits to encode what you’re after. If you’ve ever seen a really bad Internet image with strange lines around the high contrast bits, you’re seeing lossy compression artefacts. You probably don’t want that in your genome. However, the amount of compression you do depends on the size of the thing you’re trying to compress so now you have to work out if the time to transmit everything is still worse than the time taken to compress things and then send the shorter version. Signals Ain’t Simple and Networks Ain’t Wires. In earlier days of the telephone, the movement of the diaphragm in the mouthpiece generated electricity that was sent down the wires, amplified along the way, and then finally used to make movement in the earpiece that you interpreted as sound. Changes in the electric values weren’t limited to strict values of on or off and, when the signal got interfered with, all sorts of weird things happen. Remember analog television and all those shadows, snow and fuzzy images? Digital encoding takes the measurements of the analog world and turns it into a set of 0s and 1s. You send 0s and 1s (binary) and this is turned back into something recognisable (or used appropriately) at the other end. So now we get amazingly clear television until too much of the signal is lost and then we get nothing. But, up until then, progress! But we don’t send giant long streams across a long set of wires, we send information in small packets that contain some data, some information on where to send it and it goes through an array of active electronic devices that take your message from one place to another. The problem is that those packet headers add overhead, just like trying to mail a book with individual pages in addressed envelopes in the postal service would. It takes time to get something onto the network and it also adds more bits! Argh! More bits! But it can’t get any worse can it? Oh, no. It’s yet more data to send. And what’s worse is that a loss close to the destination will require you to send all of that information from your end again. Suddenly that Earth-Mars teleporter isn’t looking like such a great idea, is it, what with the 8-16 minute delay every time a cosmic ray interferes with your network transmission in space. And if you’re trying to send from a wireless terminal in a city? Forget it – the WiFi network is so saturated in many built-up areas that your error rates are going to be huge. For a web page, eh, it will take a while. For a Skype call, it will get choppy. For a human information sequence… not good enough. Well, yes. Sometimes things don’t just get lost but they show up at weird times and in weird orders. Now, for some things, like a web page, this doesn’t matter because your computer can wait until it gets all of the information and then show you the page. But, for telephone calls, it does matter because losing a second of call from a minute ago won’t make any sense if it shows up now and you’re trying to keep it real time. For teleporters there’s a weird problem in that you have to start asking questions like “how much of a human is contained in that packet”? Do you actually want to have the possibility of duplicate messages in the network or have you accidentally created extra humans? Without duplication possibilities, your error recovery rate will plummet, unless you build in a lot more error correction, which adds computation time and, sorry, increases the number of bits to send yet again. This is a core consideration of any distributed system, where we have to think about how many copies of something we need to send to ensure that we get one – or whether we care if we have more than one. PLEASE LET THERE BE NO MORE! Oh, You Wanted Security, Integrity and Authenticity, Did You? I’m not sure I’d want people reading my genome or mind state as it traversed across the Internet and, while we could pretend that we have a super-secret private network, security through obscurity (hiding our network or data) really doesn’t work. So, sorry to say, we’re going to have to encrypt our data to make sure that no-one else can read it but we also have to carry out integrity tests to make sure that what we sent is what we thought we sent – we don’t want to send a NICK packet and end up with a MICE packet, for simplistic example. And this is going to have to be sent down the same network as before so we’re putting more data bits down that poor beleaguered network. But governments can get in the way, too. For example, the FREAK security flaw is a hangover from 90’s security paranoia that has never been fixed. Will governments demand in-transit inspection of certain travellers or the removal of contraband encoded elements prior to materialisation? How do you patch a hole that might have secretly removed essential proteins from the livers of every consular official of a particular country? The security protocols and approach required for a teleporter culture could define an entire freshman seminar in maths and CS and you could still never quite have scratched the surface. But we are now wandering into the most complex areas of all. How do we define what it means to be human? Is it the information associated with our physical state (locations, spin states and energy levels) or do we have to duplicate all of the atoms? If we can produce two different copies of the same person, the dreaded transporter accident, what does this say about the human soul? Which one is real? How do we deal with lost packets? Are they a person? What state do they have? To whom do they belong? If we transmit to a site that is destroyed just after materialisation, can we then transmit to a safe site to restore the person or is that on shaky ground? Do we need to develop special programming languages that make it impossible to carry out actions that would violate certain ethical or established protocols? How do we sign off on code for this? How do we test it? There are many excellent Science Fiction works referenced in the early links and many more out there, although people are backing away from it in harder SF because it does appear to be basically impossible. But if a networking student could understand all of the issues that I’ve raised here and discuss solutions in detail, they’d basically have passed my course. And all by discussing an impossible thing. With thanks to Sean Williams, Adelaide author, who has been discussing this a lot as he writes about teleportation from the SF perspective and inspired this post.